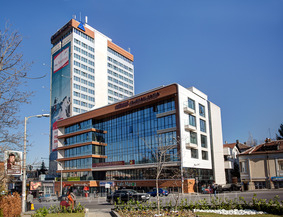 Location: Hemus Hotel is located next to the entrance of metro station “European Union”, 500 m from most of the major public transport stops and 1 km away from the main shopping street “Vitosha”. The unique location ensures quick access to most of the cultural, commercial and administrative building and also to most of the tourist attractions of the capital. Accommodation: Hemus hotel and its new wing BUSINESS CENTER HEMUS have a total of 229 rooms and suites, which are capable of meeting the requirements of individual and business clients as well as tourist groups. The high – rise wing of Hemus Hotel has 208 rooms of which 12 small apartments type Hemus and 8 VIP apartments. The rooms reveal a panoramic view of the Sofia city center from the north and of Vitosha Mountain from the south. Standard Room - repaired , TV, air conditioning, free wireless internet. Room Classic - renovated , newly furnished , TV, mini bar, free wireless internet. Small apartment type Hemus - furnished with a bed, a small living room, bathroom, TV, mini bar, free wireless internet. Apartment type VIP - a luxury apartment with a bedroom, living room , TV, mini bar , separate toilet and bathroom with separate toilet , hairdryer and cosmetic mirror air conditioning, free wireless internet. BUSINESS CENTER HEMUS offers 21 business suites, of which 12 single and 9 – double. The roms are spacious, stylish and comfortable. Single Business Suite - spacious and modern, LED TV, mini bar, bathroom with tub and extra radiator, VIP charge, hairdryer, wireless high speed internet. Double Business Suite - luxury apartment with modern furniture with double bed or twin beds, LED TV, mini bar, bathroom with tub and extra heater , hairdryer , VIP charge , wireless high speed internet. Bars and restaurants: The restaurant of Hemus Hotel /120 seats capacity/ is the idea venue for business meetings and romantic dinners, as well as special occasions, corporate events and weddings. A summer terrace /66 seats capacity/, which offers a spectacular panoramic view over the center of Sofia , is available to our guests during the warm months. Clients are also welcome to the lobby bar, where they can enjoy an excellent choice of alcoholic and non – alcoholic beverages among a cozy setting. PRESLAV – the largest conference hall with a capacity of 30 to 130 persons/depending on the arrangement/. Air conditioned , with daylight, and remote control blinds to ensure maximum comfort for different types of events. Free high-speed wireless internet connection. CONFERANCES 1 A/B - two conncted with each other premises with /capacity of up to 30 people/ , which can be used for two working groups or a small event with a coffee break in one of the parts . Air conditioned , with daylight , blinds , wireless internet - free of charge. CONFERENCE 2 - the smallest conference room, which is very suitable for events with a limited number of participants / not more than 20 /. With daylight, air conditioned . Free wireless internet connection. CONFERENCE HALL HEMUS - located in the restaurant and separated as part of it. Suitable for activities associated with cocktales and/or banquets. The capacity is from 20 to 50 seats, depending on the type of arrangement . Daylight, views of the central part of Sofia , high-speed wireless internet. CONFERENCE HALL COM – the only completely separated conference room, which is located on the third floor and provides full discretion in the conduct of small events, business meetings, team buildings, etc . With daylight and great views of Sofia`s downtown. Air conditioned , with free wireless internet. Facilities: At guests' disposal is guarded underground parking upon extra charge. The Wi-Fi internet in the hotel is free of charge for the hotel's guests.